It's stars and stripes forever with the Men's Elite LTD Country Jersey. 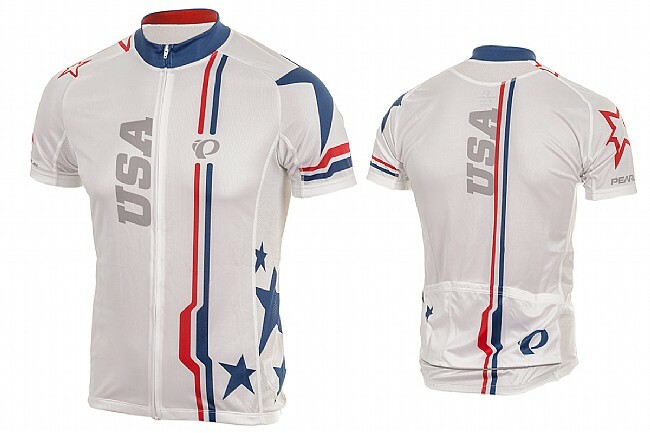 For this jersey, Pearl Izumi took their ELITE Transfer fabric and gave it a design to commemorate USA cycling. The red, white, and blue colorway lets you represent the USA in classy style. On the performance side, the fabric provides superior moisture transfer and features Direct-Vent panels to keep you cool, and flatlock seams for chafe free comfort. Reflective piping keeps you visible in low light and the three rear pockets have room for ride essentials. The Men's Elite LTD Country Jersey in the colors of the USA and features a Form Fit. I have been a huge fan of PI gear for 26 years of cycling. One thing I noticed, however, over the last several years is a growing inconsistency in their sizing. It seems they started upsizing products, particularly jerseys, to possibly account for us larger Americans versus those spindly Euros. I am a lean 6'1 185lbs, and for years fit comfortably into XL jerseys, bibs, tights, and jackets. Now, however, SOME XL stuff is simply huge, while some fits well. You really have to pay attention to whether it is Race Fit, Semi, or Club Fit. Their higher end race-fit gear still fits perfectly, but now in Semi (I don't buy club) I go down a Large and hope it works. I own other PI Elite jerseys that fit perfectly in size Large. I bought this particular model in a Large and found it to be just a tad on the Small side-not enough to send back, but just enough to be a disappointing annoyance. The XL would be unequivocally too large for me. Quality-wise, it is not as silky smooth and stretchy as my other Elite models, but it is decent considering the smoking sale price I paid. I was really impressed, I'm a PI consumer for now for sure. I had purchased a OI jersey before and was dissapointed with the fit. I didn't know they had different fits. This one is nice and fitted, but not tight. I have a 35 chest and the small fits perfect. It has great length and the pockets are tight and deep The reflective strip at the hem looks good too. I know it looks a bit gaudy from the photos, but it's my nicest jersey. Also, I can't stress enough how well made this jersey is. You know sometimes you buy 200.00 jerseys and hey have loose threads or uneven seems and the material is thin and feels fragile. This has NONE OF THAT!